[S11] Alison Weir, Britain's Royal Families: The Complete Genealogy (London, U.K.: The Bodley Head, 1999), page 313. Hereinafter cited as Britain's Royal Families. [S12] C. Arnold McNaughton, The Book of Kings, volume 1, page 102. [S45] Marcellus Donald R. von Redlich, Pedigrees of Some of the Emperor Charlemagne's Descendants, volume I (1941; reprint, Baltimore, Maryland, U.S.A.: Genealogical Publishing Company, 2002), page 77. Hereinafter cited as Pedigrees of Emperor Charlemagne, I.
Viktor II Prinz von Anhalt-Bernburg-Schaumburg-Hoym was born on 2 November 1767 at Schaumburg, GermanyG. He was the son of Karl Ludwig Prinz von Anhalt-Bernburg-Schaumburg-Hoym and Eleonore Prinzessin von Solms-Baruth. He married Amelie Prinzessin von Nassau-Weilburg, daughter of Karl Christian Fürst von Nassau-Weilburg and Wilhelmina Karolina van Oranje-Nassau, Princess of Orange, on 29 October 1793 at Weilburg, GermanyG. He died on 22 April 1812 at age 44 at Schaumburg, GermanyG. [S12] C. Arnold McNaughton, The Book of Kings, volume 1, page 388. 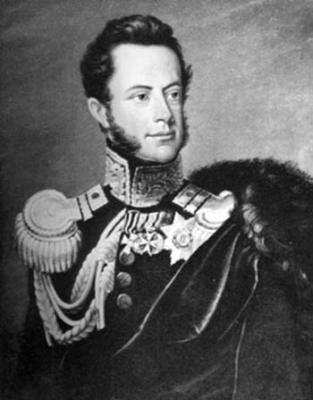 Freidrich Baron von Barchfeld was born on 14 February 1777. He married Amelie Prinzessin von Nassau-Weilburg, daughter of Karl Christian Fürst von Nassau-Weilburg and Wilhelmina Karolina van Oranje-Nassau, Princess of Orange, on 15 February 1813. He died on 4 December 1849 at age 72. [S12] C. Arnold McNaughton, The Book of Kings: A Royal Genealogy, in 3 volumes (London, U.K.: Garnstone Press, 1973), volume 1, page 206. Hereinafter cited as The Book of Kings. [S12] C. Arnold McNaughton, The Book of Kings, volume 1, page 207.